How Does a Chef’s Family Celebrate Thanksgiving? I’m curious what comes to your mind when you hear that word. 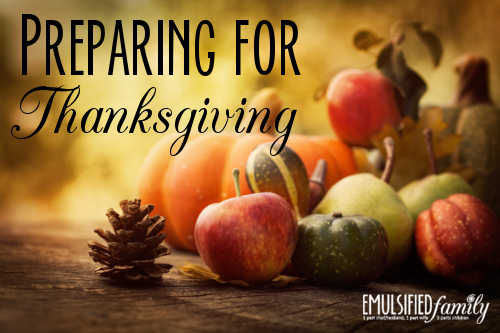 Do you think turkey, mashed potatoes, stuffing, time with family, etc? Or do you think, another holiday by myself, can’t wait ’til January so I can see my chef/husband, etc. All of those things above come to my mind as the wife of a chef. Thanksgiving is actually one of our favorite holidays. God has blessed us with so much and we love talking about that with our girls. We also love food! (Big surprise.) Brown butter mashed potatoes, maple roasted root vegetables, green bean casserole, cornbread stuffing, vanilla bean whipped potatoes, pumpkin cheesecake, rice imperative . . . and turkey (my least favorite part). Technically I’m making roasted heirloom turkey, according to my husband’s recipe, but even with the fancy title, I would be just fine if we left that out and just enjoyed all the sides and desserts. I also like the weeks leading up to Thanksgiving as there is so much “food talk” with friends. 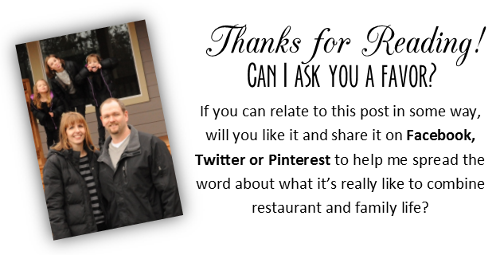 We tend to get a lot of food questions from family and friends (thus the reason for this Preparing for Thanksgiving page from my chef/husband), but I love it! I love hearing about everyone’s favorite recipes. I LOVE hearing one of my friends tell everyone about how she broke down her turkey and how AMAZING it turned out last year. I love all the Thanksgiving crafts the girls bring home from school telling what they are thankful for. Maybe I should say I just love November. However, the Thursday that the majority of the United States celebrates Thanksgiving is not the highlight of my month. Let me describe our Thanksgiving to you as the family of a chef. See if you can relate at all. The alarm goes off at some very early hour and my chef/husband gets up to go to work to feed approx. 1,000 people an amazing Thanksgiving dinner. We’ll see him some time late that night as he comes home exhausted and goes straight to bed. The girls and I get up, enjoy breakfast while watching the Macy’s Thanksgiving Day Parade on TV, relax around the house and then head out to a family or friend’s house for Thanksgiving dinner. When I talk about loving the holiday, that’s not the day I’m referring to. The day AFTER Thanksgiving is really the day I LOVE!! Let me describe that day. No alarm goes off (unless I decide to sneak out to a black Friday sale BY MYSELF!!!) We get up AS A FAMILY and enjoy breakfast AS A FAMILY. We start decorating for Christmas. Time for lunch AS A FAMILY. It’s then time for an afternoon nap/sleep catch up time for my chef/husband as we decorate a little more. Next we head out to get our Christmas Tree AS A FAMILY and then come home and decorate it. While we are decorating the tree, we heat up Thanksgiving dinner that I have been prepping since Tuesday. (Heating up Thanksgiving dinner? Gross! If that’s what you’re thinking, you really should read this.) Then we sit down and watch our first Christmas movie AS A FAMILY. If only more days could be like that . . . unfortunately, the holiday season starts after that, but more on that another time. 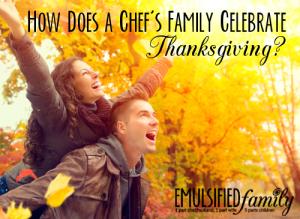 How do you celebrate Thanksgiving as a chef’s family? I’d love to hear in the comments below! Our previous Thanksgivings have consisted of my Chef working and us going to which ever cousin was hosting a big family gathering. Then on the Sunday after Thanksgiving we host a large (25 or so peeps) after Thanksgiving potluck with family and friends. Hubby cooks two birds and I make a family tradition stuffing recipe. Everyone else brings sides and dessert. This year the new restaurant he is working for actually closes on Thanksgiving Day and Christmas day!! Funny thing is when we told our friends that, their first question was are we still doing the after Thanksgiving potluck? LOL So this year on Thursday we will be hosting a small family (12 peeps) only dinner. Then on Sunday we decided to mix it up and do an Italian potluck. Hubby is looking forward to that as well. Already got most of the menu planned. And on Thanksgiving morning he is actually going to get up early and do a 5K with me as well. Crazy guy but I love him.